Here, culinary historian Pamela Foster’s traditional recipes for hot cross buns, roast lamb and rich Simnel cake. Easter is one of the major Christian festivals of the year filled with plenty of customs, folklore and food. A moveable feast, Easter occurs the First Sunday after the Full Moon following the Vernal Equinox in the Northern Hemisphere. Roughly sometime between late March and early April. In the UK, Maundy Thursday is celebrated the Thursday before Easter, the day of the Last Supper. “Maundy” is French meaning to “command” or “mandate” referring to Christ’s command at the Last Supper to “love one another as I have loved you.” The Queen participates in the Ceremony of the Royal Maundy, dating back to Edward I where deserving senior citizens are recognized for service to their community. Marking the end of Lent, Holy Week leads to Good Friday which commemorates the crucifixion and death of Jesus Christ. On Easter Sunday Christians celebrate his resurrection. 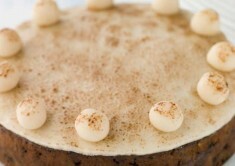 Traditional foods include hot cross buns, roast lamb and rich Simnel cake. Hot cross buns are traditionally served hot or toasted on Good Friday, the cross standing as a symbol of the Crucifixion. They are closely related to the currant bun. My Granny’s Sweet Bun recipe can easily be transformed into hot cross buns by adding cinnamon, cloves and nutmeg, currants, and candied peel when you first mix the ingredients. 2. Turn out the risen dough onto a floured surface. Shape into two 12 inch long logs about 3 inches thick. Cut the dough into equal pieces. You should have 24. If you have more, blame my Granny, she was always making more than she needed for unexpected company. 3. Work each piece of dough into smooth, seamless balls. Place buns on two greased baking sheets leaving 2 inches between each bun. Cover with a clean tea towel and let rest for 30–45 minutes in a draft free place, or in your oven. 5. Mix the egg with caster sugar to make an egg glaze. Brush buns with the egg glaze. in the ends at the bottom of the bun. You can skip this step and simply use thick icing to pipe a cross onto each bun after the buns have been baked and cooled. 7. Bake buns in upper and lower thirds of oven, switching position of sheets halfway through baking, until golden, about 12 minutes. Transfer buns to a rack to cool slightly. 8. 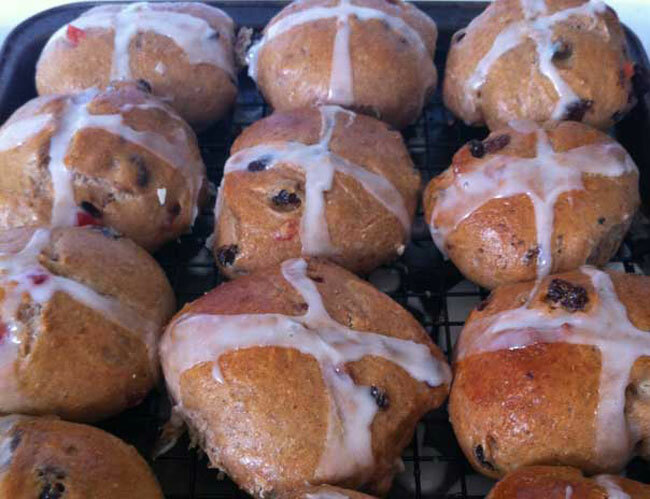 Hot cross buns can easily be made in advance of Easter and thawed before serving. You can eat these at room temperature, heated in the oven, or toasted. While this recipe can be enjoyed throughout the year, it holds the place of honor as the traditional Easter dish. 1. Trim lamb of gristle and excess fat. Stir together garlic, 2 tbsp. of the oil, rosemary, mustard and pepper; rub over surface of the meat and marinate for 1 hour at room temperature or for up to 48 hours in your refrigerator. 2. Place leg in roasting pan. 3. Pour wine and salt into a skillet and bring to boil, stirring to scrape up any brown bits; pour over meat. 4. 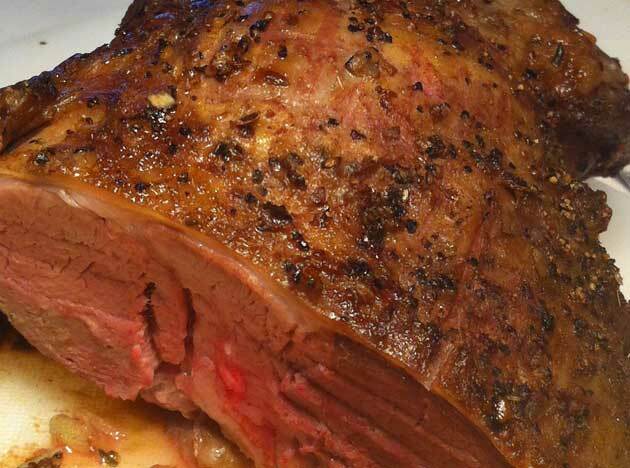 Cook lamb in 450°F for 15 minutes, then reduce the heat to 350°F. 5. Cook to your preferred taste, using a meat thermometer inserted into the middle of the meatiest part of the leg without touching the bone. 6. 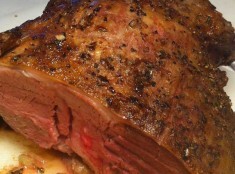 Remove roast from pan and let rest for 15 minutes before carving and serving. 7. Serve Mint Sauce alongside roast. Simnel cakes originated in the medieval era. It is a light fruitcake, covered in marzipan, then toasted. Eating of the cake signifies the end of Lent so it is rich with the butter, eggs and milk which were restricted during Lent. Marizipan or almond paste is baked into the middle and topped with eleven marzipan balls representing the true disciples of Jesus (omitting Judas). In some variations Christ is also represented by the placement of a ball in the centre. The cake is also served as Mothering Cake. While Mother’s Day is celebrated in early May in North America, families across the British Isles celebrate on the 4th Sunday of Lent. Mothering Sunday was commemorated in England in the 1600s, a day for all — including servants — to spend a day with their mothers. outline and cut inside the line to ensure a good fit. 2. Preheat oven to 325°F. Prepare a 9 inch spring form pan, by lightly greasing the bottom and sides. 3. Sift flour, salt and spices together, then stir in fruit and peel. Cream butter and sugar thoroughly until light and creamy, then beat in eggs one at a time, until the mixture is fluffy. Reserve a teaspoon of egg for finishing the cake later. Gently stir flour and fruit into the creamed mixture in two stages, adding a little more milk to give the mixture a dropping consistency. 4. Place half the mixture into the prepared pan. Place one pre-rolled round of almond paste on top. Cover with remaining cake mixture. Before baking the cake, give the pan a few sharp taps on a firm surface. This settles the mixture and prevents holes from forming in the cake. 5. Place the pan on a baking sheet. To prevent the cake from drying out, wrap corrugated cardboard — extending about an inch above the pan — and secure it with twine. 6. Bake in the centre of the oven for 1 hour. Lower the heat to 300°F and bake for an additional 3 hours or until a thin metal skewer inserted in the centre of the cake comes out clean. 7. Level the cake by placing a heavy pot on top of the cooked cake while it is still hot. When the cake has cooled slightly, remove the pot and the cardboard, and place the cake on a wire rack, allowing to cool completely in the pan. 8. Brush the top of the cake with apricot jam which has been warmed, then cover the top of the cake with the second round of almond paste. Roll 11 small balls of retained paste and place evenly around the edges on top of the cake. Brush the top with a little beaten egg and very lightly brown under the grill until the almond paste turns light golden brown. Remove and leave to cool. You can now release the clip on the spring form pan. 9. The cake is often decorated with a ribbon tied around the base and a few edible flowers placed on the top. Pamela Foster is a culinary historian who resides in the Greater Toronto Area with her husband, affectionately referred to as Lord D. Her popular blog Downton Abbey Cooks explores food, history and health of the Downton era (1912- 1920s).